DISCOVER THE EASIEST WAY TO RELAX! – Are you struggling with high anxiety levels? Are you having trouble sleeping at night? Do you need a way to combat the effects of stress? The wait is over. 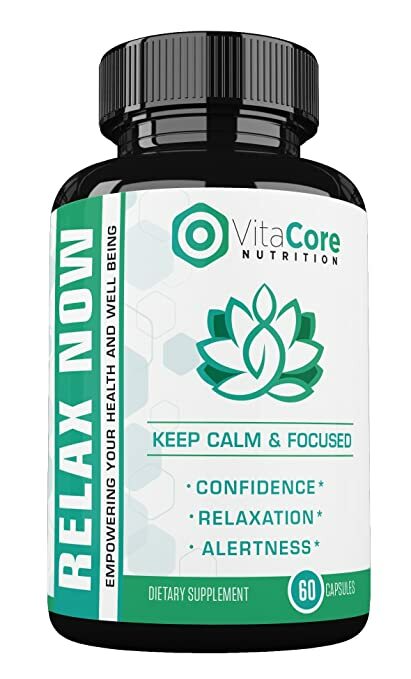 The VitaCore Nutrition Relax Now premium, doctor-formulated dietary supplement is the natural and healthy way to promote relaxation, alertness and boost your confidence! NATURE’S SUPER-INGREDIENTS TO THE RESCUE! – Our exclusive Relax Now capsules contain a number of unique, natural and healthy ingredients that will help you achieve the desired results. The Vitamin B complex is known to be linked with improved mood and enhanced sleeping habits. Healthy botanicals such as Hawthorn, Lemon Balm and Passion Flower will ensure your calmness, while minerals like Magnesium and Zinc will promote relaxation. COMBAT THE DETRIMENTAL EFFECTS OF STRESS! – The Relax Now formula contains Ashwagandha (or Indian Ginseng) powder which has been used for millennia for its restorative benefits, immune system-boosting features and its rejuvenating properties! Other ingredients are Rhadiola Rosea, which promotes physical and cognitive vitality and Bacopa Monnieri, which reduces anxiety and aids in longevity and cognitive enhancement! FEELING STRESSED OR TIRED? YOU CAN RELAX NOW! – Finally, you can eliminate chronic fatigue, reduce anxiety levels and boost your productivity with the VitaCore Nutrition Relax Now safe and healthy dietary supplement! Ideal for busy individuals, like students, die-hard gamers, entrepreneurs, blue and white-collar workers and anybody in need of a relaxation catalyst! YOUR HEALTH & WELL-BEING IS OUR TOP PRIORITY! – We, at VitaCore Nutrition, believe that you deserve the most advanced and natural, vegetarian dietary supplement available. Our elite Relax Now will promote calmness, confidence and motivation without any frustrating side-effects! Plus, just to put your mind at ease, we proudly back our product with a hassle-free, 30-day money back guarantee! Stop Wasting Money On Low-Quality Potentially Harmful Supplements & Discover The Most Natural & Healthiest Solution! Are you constantly feeling tired and stressed-out? Do you have trouble relaxing and enjoying a full-night’s sleep? Do you want to combat the detrimental effects of anxiety on your health? Presenting The VitaCore Exclusive, Natural & Healthy Relax Now Relaxation Booster! This premium doctor-formulate dietary supplement is the ideal way to promote calmness, confidence and relaxation without any harmful side-effects. Plus, it will help you reduce stress and anxiety levels, thus empowering your health and well-being! Unique Natural Super-Ingredients For Maximum Results! Our safe and natural formula contains Vitamins B1, B2, B5 and B6 from the Vitamin-B Complex that are important for sleep and are linked with improved mood. Healthy minerals such as Magnesium and Zinc are known to promote relaxation, while organic super-herbs such as Hawthorn, Lemon Balm, Passion Flower and Hops are said to reduce stress levels. Ashwagandha (or Indian Ginseng), helps combat the effects of anxiety and has unique rejuvenating properties, Rhodelia Rosea is a Russian herb that enhances cognitive function and balances the brain and finally, Bacopa Monnieriis known to increase dopamine and serotonin levels. You Are The Reason We Are In Business! Your health and well-being are our #1 priorities, that’s why we believe that our exclusive Relax Now vegetarian supplement will offer you that much-needed relaxation. Just to put your mind at ease, we proudly back our elite product with a hassle-free 30-day money back guarantee! Can You Afford To Miss Out On This Opportunity? Indulge Yourself! Click “Add To Cart” Now!